When camping or hiking or even during an emergency drinking water becomes very important (water is important everyday really). You can store water easily if you don’t have to travel or evacuate, but carrying enough water if you are on foot is very difficult and very heavy. There is a need for a portable, simple, effective way to make safe drinking water. 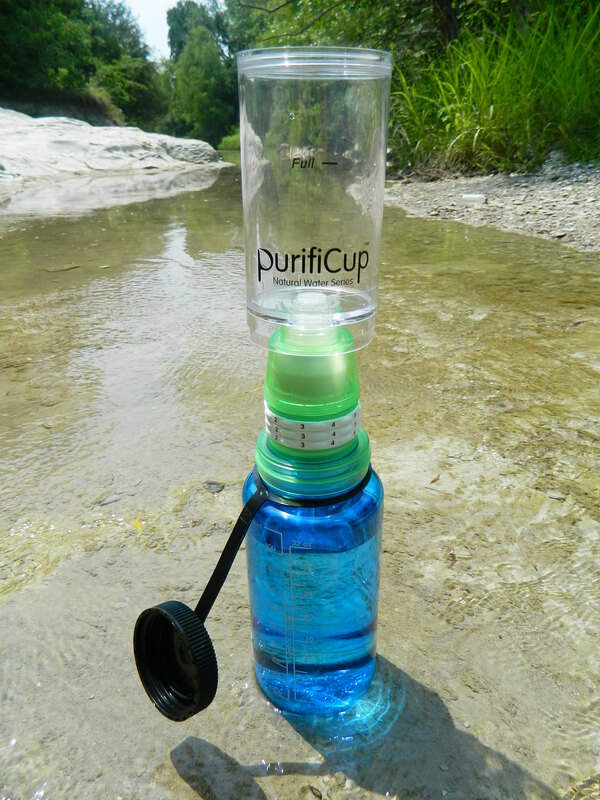 PurifiCup is a commercially available portable water solution. I had the opportunity to test one and I put it up against some laboratory tests and my own personal judgments. It is very simple to use and is compact enough to fit into any bag and most cup holders. This filter fits perfectly over wide mouth Nalgene bottles and screws directly onto standard water bottles. This product is very versatile and that makes it useful in a wide variety of situations. Normal filters treat water by physically removing suspended materials in the water. A good physical filter removes particles as small as 0.2 microns. This will make the filter capable of removing all sizes of bacteria (but not all viruses). The PurifiCup however isn’t a normal filter. It for one doesn’t filter below the 1.0 micron level. That is not rearly fine enough to remove all types of bacteria. This may seem like a bad thing, but the Purificup does something that no other portable water filter does (that I am aware of). The PurifiCup disinfects as it filters the water with a nano-silver membrane. Nano-silver has been shown to kill over 600 different types of bacteria. What I wanted to know was, in a real world setting does it work? Does the product come close to meeting the claims? 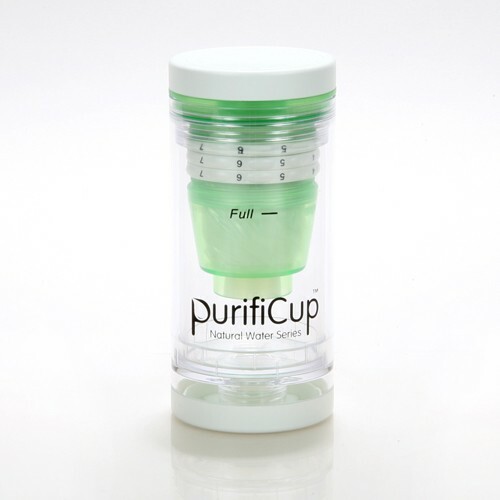 I tested the PurifiCup’s ability to remove turbidity, chlorine, color and its ability to kill bacteria. I took a sample of treated water to measure chlorine removal. The water sample I chose here is typical municipal drinking water. I also took a sample from a nearby river. This river represents a typical backup water source that could be used while hiking or in a survival situation. There was a chlorine residual of 2.03 mg/L to start with. After filtering with the PurifiCup chlorine was reduced to 0.16 mg/L. To put it simpler, there was a 97% reduction of chlorine in the tap water. That level or chlorine reduction is amazing. In the river sample I tested trubidity and color. Turbidity is the measure of suspended particles in the water, or the measure of the cloudiness of the water. Color is the measure of clarity of water, how close to perfectly clear is the water separate from suspended particles. (Science Note: turbidity measures the scatter of light through the water sample and color measures the absorption of light by the sample). If you think of loose leaf tea, turbidity is the leaves in the water and color is the brown tint the water takes on. In general the lower the turbidity an the lower the color the safer the water is to drink (this is NOT always true). The river sample started with 18.4 NTU (Nepheletic Turbidity Units) and after filtration it was 4.72 NTU. To put a little perspective to these numbers anything under 5NTU is invisible to the naked eye and at my water system I am not allowed to go over 1NTU. There was a 75% reduction in turbidity. The remaining turbidity is not terribly impressive but expected from a filter of 1.0 micron. Remember, the PurifiCup doesn’t claim to physically remove everything from the water. Color is the final parameter I tested. Color isn’t in itself a health related property of water. A lot of color doesn’t necessarily mean the water is unsafe to drink. Removal of color however is a good indicator of the removal of many dissolved chemicals. The Color of my river sample was 128 (there are no units for color). The PurifiCup reduced that number to 81. Therefore 63% of the color was removed. This may not seem like a lot, but color is one of the most difficult things to remove from water. Now for the parameter I was most curious about on a professional and personal level. Bacteria; does the PurifiCup actually disinfect water? I had to send this to an external environmental laboratory as I don’t have access to a biological lab. This limited the number and types of bacteria I tested. I chose to test for heterotrophic bacteria (heterotrophic plate count or HPC). These bacteria are not pathogenic, but they are resistant to many treatment processes and that makes them an excellent indicator of treatment success. I tested the HPC of the river and PurifiCup effluent. First, bacteria tests are measured in colony forming units (cfu). A cfu is a group of bacteria that group into a visible blob (colony) of bacteria. The raw water from the river had a cfu count of 800 and the treated water had a cfu count of 500. 500 may seem like a lot, but it is a misleading number. Remember the disinfection doesn’t mean the killing of all bacteria, that’s sterilization. Disinfection is the removal or inactivation of pathogenic bacteria. Inactivation stops the ability of bacteria to reproduce and cause disease. Like I said before 500 cfu may seem like a lot. But these 500 cfu were inactivated. Remember the 1micron filter? A lot of bacteria go through the filter, but unlike the raw sample the 500 cfu didn’t grow. So while 500 cfu is a big number, they are not able to cause disease. The PurifiCup made the sample significantly safer to drink. I highly recommend this product as part of a water purification system. The portability and low cost of the PurifiCup makes this product a simple addition to your emergency preparations or for an avid outdoors-man’s kit. This entry was posted in Disinfection, Filtration, Preparedness, Water and tagged chemistry, chlorine, different types of bacteria, disinfection, emergency, environment, Filtration, health, ion exchange resins, nalgene water bottle, nano-silver, nature, off grid, pathogenic disease, pathogens, personal judgments, portable water filter, Prepared, Preparedness, PurifiCup, purifying water, science, Self Reliance, SHTF, treatment, water by omegam4n. Bookmark the permalink. is this water filter available in Canada? looking to order one for Emergency Prep. Hi Jeremy, I just spoke with the company, they will be shipping withing Canada within 2-3 weeks. Thank you very much for checking for me! Looking forward to try one when it gets here. Cool info you got here! ‘Great post! I travel in India and started using a UV Steripen — I haven’t been sick so far. But, I am concerned about heavy metals and pesticides etc. in the water — the Puricup claims to remove these — what do you think? Could you please tell me the stockists in Queensland Australia for Purificup. I am having trouble locating this product to buy. I have phoned Camping World Palm Beach, and they do not know product? I would really appreciate the name of a supplier please, as I wish to purchase asap.